American-born English poet, playwright and literary critic T.S. 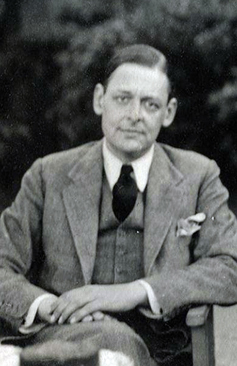 Eliot (1888-1965), was one of the pioneers of the modernist movement in literature. "We praise Thee, O God, for Thy glory displayed in all the Creatures of the earth, In the snow, in the rain, in the wind, in the storm; in all of Thy Creatures, both the hunters and the hunted. For all things exist only as seen by Thee, only as known by Thee, All things exist only in Thy light…"
"And you see behind every face the mental emptiness deepen Leaving only the growing terror of nothing to think about…"
T.S. Eliot’s work is a successful, well balanced marriage between his lofty feelings and his noble, original thought. Article picture: Thomas Stearns ('T.S.') Eliot by Lady Ottoline Morrell (died 1938).